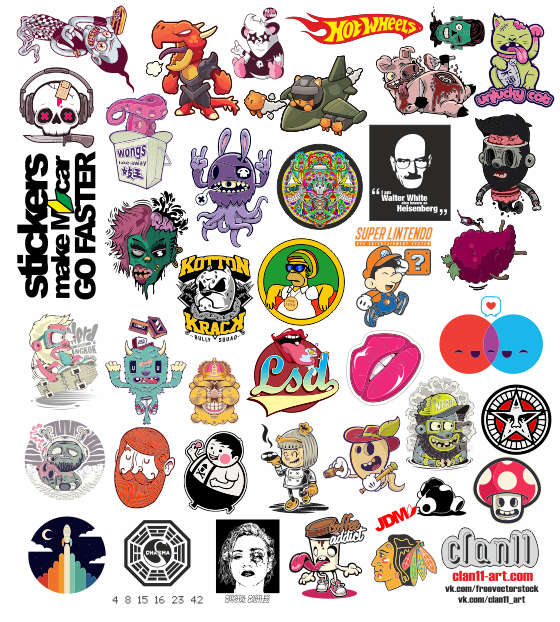 Sticker bombing is a great way to stand out, show your mood, lifestyle, passions and desires. A sticker will help your car, laptop, tablet, phone to show individuality, become a bright "spot" in the grey mass flow and on the road. Sticker bombing movement was entirely formed in Japan. The inspiration for the creation of this movement were ordinary stickers on cars for novice drivers and elderly people. First ones warned the road users that the driver was new to driving, and the latter informed that the age of the driver is more than 75 years. These distinctive signs are mandatory and warning for other drivers. Today in Japan and around the world car stickers turned into a separate culture, consisting not only of the mandatory signs, but also of the entire JDM range. Japanese Domestic Maeket (JDM) is the term meaning Japanese cars (and other products), which are sold on the Japanese market. Stickers have become a way of self-expression. With their help a driver can show their affiliation to the JDM lifestyle. In such a way, sticker bombing culture has turned into something more than just a car sticker. There is no doubt that the culture of sticker bombing is evolving and will continue to evolve. So bomb and have fun!